All this Christmas baking is vaguely nuts, so it makes sense to make something that is, actually, nuts. Or almonds to be more precise. Ricciarelli are an Italian cookie originating in the city of Siena. They are said to date back to the 14th century, when they were introduced by a knight called Ricciardetto della Gherardesca on his return from the Crusades. This sounds rather plausible, given the main ingredients – orange and almonds – are typical in Middle Eastern sweets. Indeed, given their fancy ingredients, I imagine that these were the sort of thing that were once reserved for the great and good of the city, but today we’re all able to enjoy them. So they’ve got a rather longer and nobler lineage than stained glass cookies! 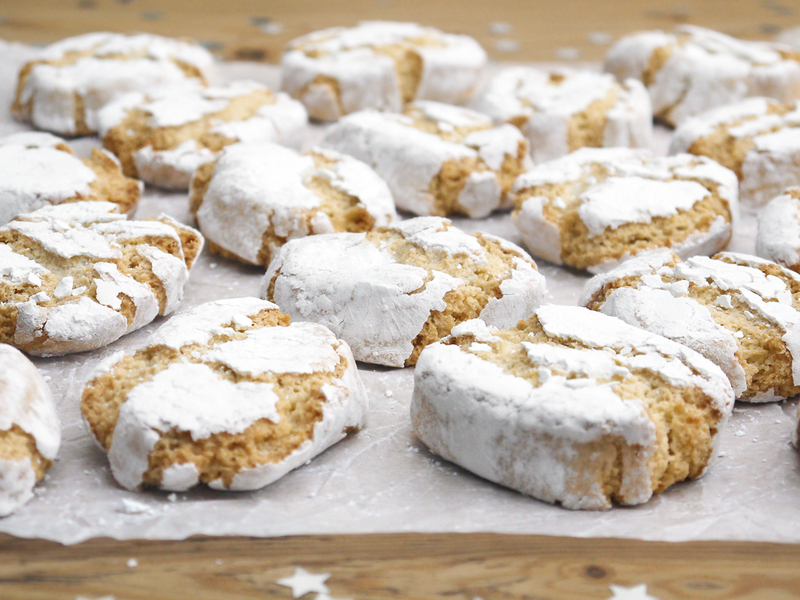 Ricciarelli are made from almonds, sugar and egg whites, so they are a sort of macaroon, but flavoured with vanilla, orange zest and almond extract. When you make the mixture, the aroma is absolutely divine! It is like a very rich, sophisticated orange blossom scent, which hints that something very delicious is coming out of the oven. I’ve used two teaspoons of almond extract, but you can add more if you want a really strong bitter almond flavour. All this means that they really taste rather luxurious. 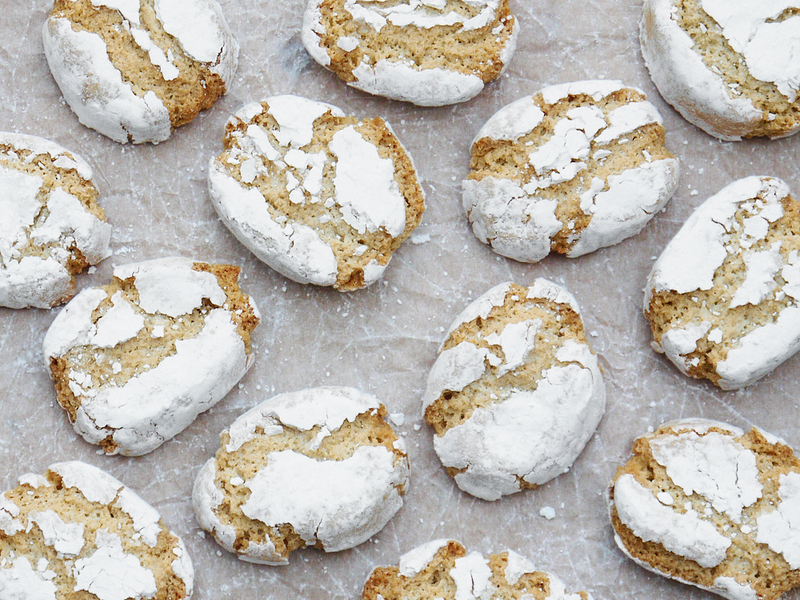 Italy is so proud of these little sweetmeats that they have “protected geographical indication” legal protection, so if you are anywhere outside the city of Siena, your luck is out – you can’t call them Ricciarelli di Siena without getting into hot water. Making them is very straightforward – make the dough, cut into pieces, shape and cover in icing sugar. When they go into the oven, they puff up and develop their cracked surface, which reveals those little seams of golden marzipan. The outside goes slightly crisp, while they remain soft inside. I think these make a lovely addition to the festive spread. They have all the flavour of marzipan, but might lighter, and the orange zest, vanilla and almond extracts all make for a very aromatic cookie that makes for a nice alternative to spices and chocolate. Once you taste them, they provide a pretty good incentive to get over to Siena and try the real deal! 1. Put the ground almonds, orange zest and baking power in a bowl. Mix well. 2. In a separate bowl, whisk the egg whites until very stiff. Add the sugar and keep beating until you have a stiff meringue mixture. Mix in the almond and vanilla extracts, then fold in the ground almond mixture. The batter will seem heavy and rather sticky. Cover the mixture and leave overnight in the fridge. 3. Preheat the oven to 160°C (320°F). Line a baking tray with greaseproof paper and rub lightly with butter or oil. 4. Cover a worktop in lots of icing sugar. Take the dough and roll out into a long sausage – don’t worry about getting the dough covering in icing sugar, this is the point! Cut the log into 20 pieces. 5. Take each piece of dough. Make sure the exposed dough gets a coating of icing sugar, then use your hands to shape into a slightly pointed oval shape. Cover each piece in more icing sugar (it should be really, really well coated). Arrange a few centimetres apart on the baking tray. I did mine in two batches, so 10 per tray. 6. 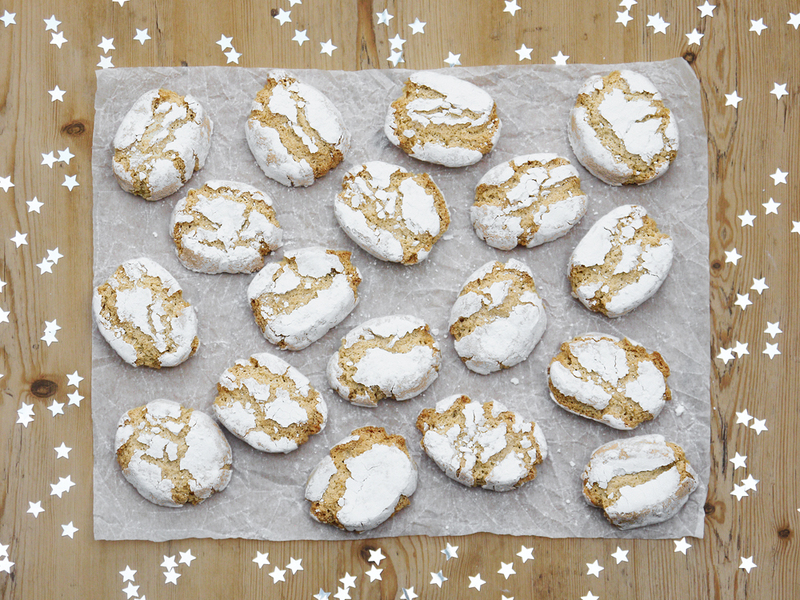 Bake the ricciarelli for around 20 minutes until they are slightly puffed, cracked and the inside looks just golden. Turn half-way to get an even colour. Remove from the oven and allow to stand for a minute, then transfer to a rack to cool completely. Awesome the recipe, and stunning the pictures!